Ok this is embarrassing. I was kindly gifted some Gillette Bleue Extra razor blades last year and have just got around to trying them. To my frustration I find I'm having trouble getting the blades out of the plastic box. I'm imaging I'd slide them out by moving my fingers sideways on the front opening. They seem very tightly fixed in place and not inclined to move. This has never happened to me before, but I havn't used blades with exactly this style of packaging. No doubt I'll shortly be feeling chagrined about the matter. Any help will be appreciated. Nope, this is a not uncommon problem with some packs of old blades. Others might chime in with better options but I have ‘a friend’ who took a hammer to one of these packages. Figured a blow from a boo would break the plastic but not harm the shaving edges. Thanks Mark. I might try something less drastic first. Maybe pliers? Still hoping someone here has found "the secret" to getting them free. Yeah, there may we’ll be a less drastic option - but this did work! I'd suggest immersion in hot water for a few moments; sufficient to melt any "adhesion", or slightly expand the plastic case. Bad idea @Bucephalus because the blade will expand under hot water in the plastic case. I have the same issue. 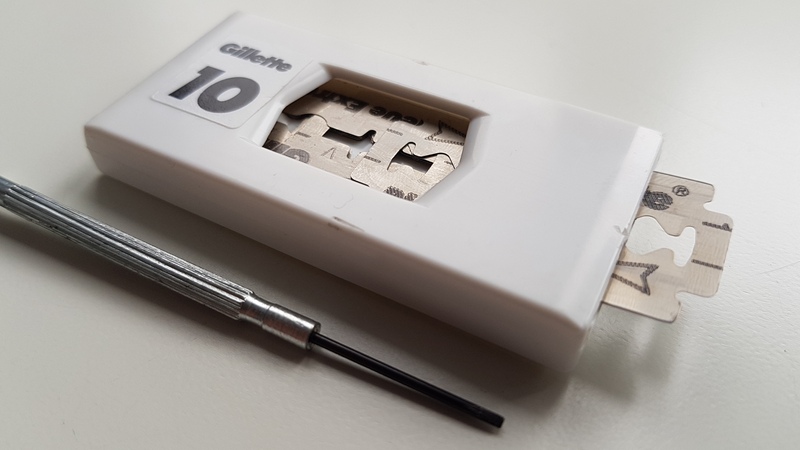 My solution use a small screwdriver and push against the top most blade. ( I use the groves in the middle of the razor). I'll give this a try, thanks Rami. I'll admit I gave up for this mornings shave and used a Polsilver instead. I’ll report back. Nice to see it's not just me being clueless! 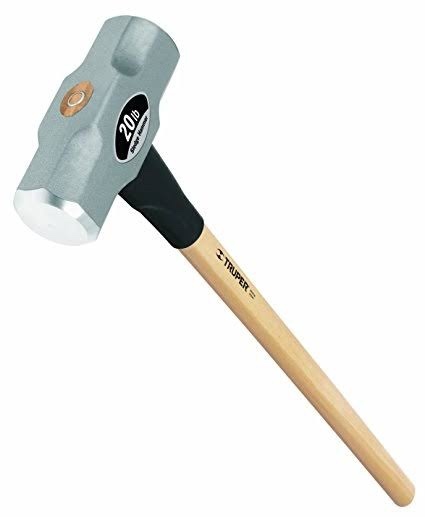 Settle down everyone.... put down the axe/sledgehammer/angle grinders. Its a well known problem. GBE's and some earlier blades from Gillette usually had some mineral oil applied to them, however over the years this oxidises and becomes sticky. This in effect becomes 'glue', and now you cannot slide them out with your thumb. 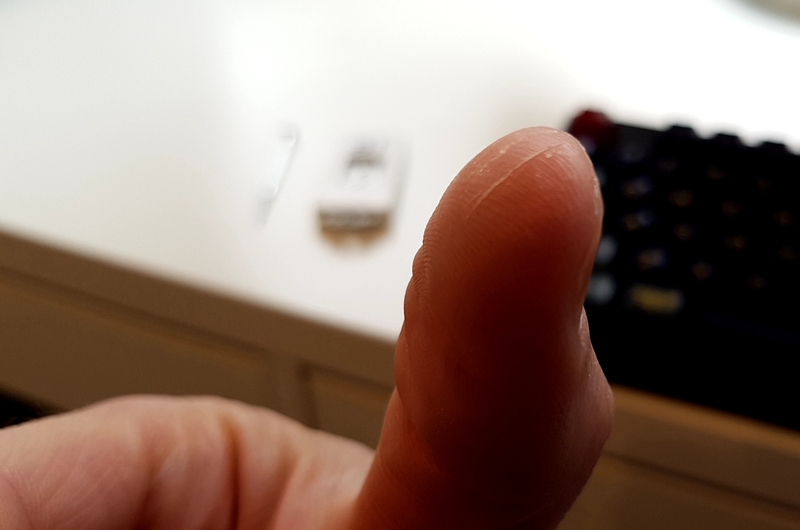 Your thumb is still the best way - but I recommend doing it not when your hands are wet or after a shower as the sharp edges of the punch-out will generally slice your skin up a bit. Instead, with clean, dry hands, press your thumb against the top blade - away from the punch-out - and gently apply pressure in the direction of the arrow. Slowly increase the pressure and you will feel it slowly start to give and it will come free. You can also put a towel over the opening and use the dispenser in the normal way if your hands are wet. I have tonnes of these and I have the same issue as you, but I never have a problem with it. Never needed hot water or anything like that to get them free, but I have sliced my thumb up a bit! But there is a price to be paid for the liberation. I ended up using a combination of methods. Monsta_AU gave me hope it was not hopeless. So I tried using gentle finger pressure away from the punch-out but alas, as can be seen I flew too close to the sun and my puny thumb was not up to the task . Then I thought about smashing with hammer for a few seconds! Finally I tried a jeweler's screwdriver and it moved a tiny bit and then all the way. I'm hoping the rest are a bit less work. Thank you all for the help. Big relief to know it wasn't user error! Looking forward to see if these blades live up to the legendary reputation. Yea my thumb is not up to the task either. Polsilvers, once again, saving the day! So it's all about the finger technique?